What’s better than the tear down gal doing a tear down of her own business? I’ve seen a lot of Year In Review posts over the years and I know they can feel very “yay! look what I did!” from the outside. But as I sit here on the inside writing this, I have to tell you that it feels so much more capital V Vulnerable than that. I’m used to tearing down emails of other businesses, sharing what worked and what is missing the mark. I’ve gotten used to writing those and can do a tear down in my head with any email thrown in front of me (more on that in a bit). It’s harder, however, to eat my own dog food. But, just like I do in my email onboarding tear downs, the whole point of this thing is to give you the good, the bad, and the ugly. I’m writing it as a public document so that you can learn from my wins and losses and maybe, just maybe, not feel so alone in your own highs and lows as a business owner. Ready to dive in? I am. Email onboarding tear downs were a huge hit. While I was scared out of my mind to hit publish on that first one, the tear downs I started publishing in January 2018 became wildly popular and every single one led to a new client. I honed my voice and writing skills and got to build a nice little portfolio of spec work while I worked on moving more firmly into this specialization. I worked with some kickass clients. Unless they’re a published case study on my website, I’m not really the “kiss and tell” type but I have had the pleasure of working with some dreamies this last year. From membership sites to scheduling tools to project management apps to photo printing to foods I love eating, I worked with some of the best in B2C SaaS and eCommerce. Things didn’t always go smoothly (more on that in a bit) and I learned a metric ton about client management and positioning but I came out on this side better for it. I have the word “student” tattoo’d on my inner left wrist for a reason. Every single client I worked with I learned from. I learned about business models and hiring and firing and funnels and feedback and collaboration and copy. I’m never not learning and it was a complete honor to get to surround myself with the incredible business owners who trusted me with their emails this last year. Taking time away from paying client work and two little kids at home is hard but I was committed to traveling more in 2018 and I did it. 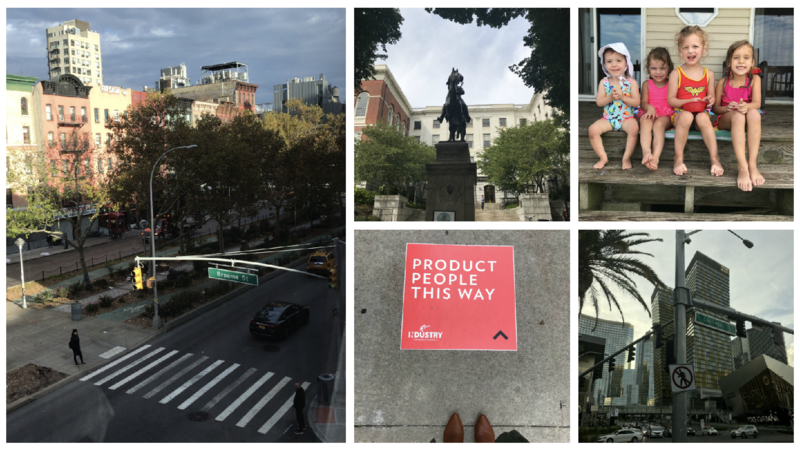 I went to MicroConf in Vegas, Industry in Cleveland, Litmus Live in Boston, and a mastermind event in NYC. Every trip was as tight as possible since there are 1,001 things to prep/consider when leaving your two small kiddos for an extended period of time but every trip was so valuable on a personal and professional level. We also took a family trip to the lake over the summer and I got to hang with my siblings and all of the kids got to play on a beach together. It’s always fun to see your kids live their best life and I got to do just that. Speaking gigs have started coming in. This is a big goal of mine for 2019 (to do more speaking) and this year gave me a good testing ground for what I hope to take “to the mainstage” this next year. I was chosen by my fellow attendees to give an attendee talk at MicroConf, I led a workshop at Interact18, I taught a session for Forget the Funnel, CXL Institute asked me to teach a course on retention, and I was invited by the team at Litmus to do a Live Optimization webinar that was a smash hit. Podcasts were also part of the speaking mix. I also spoke on a dozen podcasts about everything from email marketing to freelancing to being a mom and business owner. All of that experience is paying off too. I was invited to lead a workshop at Domina Retreat this coming April and asked to talk email with the crowd at TCC IRL in March 2019. My writing has taken off. I also got to guest post on some incredible websites like Appcues, InVision, and Trello and the editors there are some of the best in the biz. When you learn more in the editing process than you did in the writing of the article, you better hang onto that editor. Partnerships ramped up and kept going. One thing I pride myself on is my relationships. While relationship management didn’t always go well in 2018 (more below), I was able to stay in touch with a few people I really admire and I got to better know some of the people who helped me get to where I am today. The list is truly too long to post here but I’ll just say I sent a LOT of holiday cards this year. I cleaned up my act. Since March 2018 I’ve had maybe 5 drinks. Drinking was never problematic for me other than the fact that it heightened my anxiety, made me grumpy the next day, and generally zapped my social skills not to mention hydration efforts. So I quit (mostly). Same with foods that have always given me pause (dairy, most gluten, beans, peppers). I’m an adult and the most wonderful part of that is that I get to choose what I put in my body. This year I decided that feeling like crap for 2+ days after consuming one of the previously stated items just wasn’t worth it. Plus vegan and gluten free bakeries are a thing so I’m just fine thankyouverymuch. I broke the magical 6-figure mark. And guess what? It isn’t all that magical. It’s actually a lot of freakin’ work and you better be ready for it when it comes. One cool side benefit is that I was able to pay off my debt so there’s that. But you know what? I spent 5 years prior to 2018 wishing and hoping to hit this goal and now that I’m here I know that I wasn’t ready back then. I also don’t find it all that magical. It’s just a lot more to juggle. I worked a lot of nights. While I’m pretty sure I don’t work more than even 30 hours a week, my work this year has come in fits and spurts to the detriment of my downtime. My kids are in childcare from 8a-4p M-F which is plenty of time for me to complete my client work and also do the building of my business. But I’m a born night owl and I know that I do my best thinking/work from 8-11pm. I had too many days where I let the workday fly by and I found myself rubbing my eyes and cracking open my laptop after the kids were in bed. While I might be more inclined to work at night, I have to recognize that in this season of my life that just isn’t possible and it’s time to get serious about adjusting my patterns, at least for now. I gave two partial refunds and fired a client. Told you it’s not always magical fun over here in 100k+ Land. I’ve run my business mostly by myself this last year and I’ve for sure bitten off more than I could chew at times. Occasionally I brought in an incredible subcontractor to help me offload some of the implementation but most of the time I just sucked it up and admitted my mistake. The other side of this is that I took on less-than-ideal clients… and I knew it when I said “sure, I can help you!” Oh, Val. Come on. Those Crappy Clients took away from Really Great Clients so I had to refund people I loved and fire people I didn’t love. Both sucked. In the second half of the year I learned from those mistakes and figured out a decent workload balance. I also built out a variety of offerings so I no longer do deep dive projects with every single person who comes into my inbox. Now I have a DIY offering, a DWY (done with you) offer, and a DFY (done for you) service. I love the DWY and plan to ramp that up more in the future. I didn’t read as much fiction as I want to. If there’s one thing I really love, it’s reading. Specifically fiction, though I do love a few well-chosen non-fiction books too. With all of the night working and client juggling happening, reading actual books really dropped to the bottom of my list. Not reading meant my writing suffered and my brain never got to relax into another genre/focus. I lived and breathed business and parenting and that was about it. As a way to counter this for 2019, I’m committing to reading more. I’m not joining a book club or doing a reading challenge or even setting a goal number of books to read this coming year. Instead I’m saying “how many books can I get through and how can I stretch myself as a reader?” and going from there. Maybe I’ll even surprise myself and pick up a sci-fi or thriller book at some point. There was a lack of systems… everywhere. See above. A lack of systems is what led to that mess and it’s taken me the second half of the year to claw my way out of the systems rut. I’m implementing on both the software side and the people side to make this a well-oiled-email machine moving into the coming year. I’ve hired a VA team, got a bookkeeper and CPA (all in one! ), setup a formal CRM, and am using product management software to map out projects for the coming year. While I was busy focusing on and creating content about email marketing specifically for SaaS business owners, I unexpectedly grew an audience of copywriters who are busy writing emails for clients but want to better understand strategy. After talking to several of those copywriters I decided to host a workshop followed by an incubator, both focused on email marketing (more below). It was a total surprise shift for this last bit of the year but one I’m very excited about diving into over the next few months. Like I mentioned above, realizing a whole bunch of copywriters wanted to become more well-rounded email marketers led to a big shift in my business. The first quarter of 2019 means focusing on the 20 members of the incubator and helping them become the best possible email marketers out there. I used to think that in order to teach this stuff I’d have to teach business owners how to do it for themselves and always came up short since the one thing every business owner I know is strapped for is time. Running the incubator means I have more people to refer leads to and my mom gets to be right (she always wanted me to become a teacher!). I’ve said many times over the last year that onboarding is my “Trojan Horse”. People understand onboarding and know that it’s important and email is my medium of choice for customer communication. But what I really want to talk about and work on is retention. It’s why I developed that course for CXL Institute and why the talk I’m building out for 2019 is focused on customer retention. In my opinion, the businesses that have the most success long term are those who focus on helping their customers grow… and that means retention efforts. Yes, they are more costly than, say, running a bunch of Facebook Ads. But compare the revenue gains your business would see if you upgraded your existing customers to the next price point versus what you might see if you got a whole bunch of new customers on your lowest price point. Retention efforts are more costly but also have a bigger impact. I’ve always given a portion of my revenue to DonorsChoose.org (love them!) but in 2019 I want to do something more. I like Kai Davis’ scholarship fund and Gia Laudi’s support for underrepresented business owners and want to create something like this. Ideas are still brewing on this particular plan but the focus is there so I know it will come together. Learning from the lack of systems in 2018 and plugging that hole, I’m committed to seeing the gains from those changes. I’m also building out a new offering and bringing on a team of copywriters so learning how to run an agency (that doesn’t run me into the ground) is key to making 2019 a success. Thinking back on 2018 the word that comes to mind is “growth”. I grew in so many ways this last year and found myself with a beautiful list of opportunities to celebrate. How will you apply those lessons to the year to come? Are you writing your own Year In Review? Tweet me – (at)lovevalgeisler – with the details of where I can read yours and support you!